Welcome! Our group is interested in the development and applications of novel optical tools to study essential problems in chemistry, biology and neuroscience. [04/08/2019] Our jove video is online. 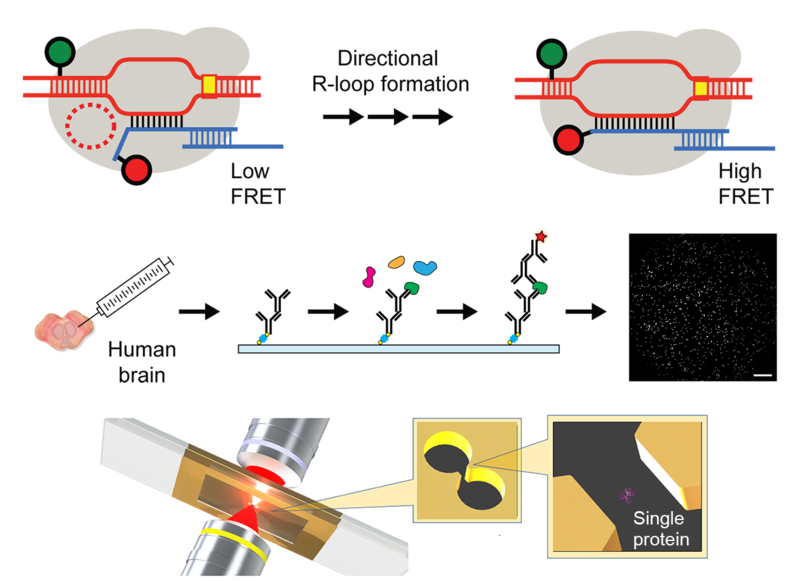 [03/22/2019] DDS + Tween20 + F(ab) fragments enable fast SiMPull. Check out Ben's paper! [03/11/2019] Our first J Cell Sci paper! It's amazing to see how nuclear speckles move and change. Like liquid droplets. [02/06/2019] Our first review paper out. Featured on Advanced Science News. [02/04/2019] Ben recieved the Best Student Paper Award at SPIE PW, Frontiers in Biological Detection. [01/23/2019] Our alumni Ian Khaw will start his work at North American Lighting. Congrats! [11/20/2018] Jinhan Ren joins our lab. Welcome! [11/08/2018] Vahid Ebrahimi joins our lab. Welcome! [10/31/2018] Ben presented at the Graduate Fellows Symposium. [8/27/2018] Jialei's HIST paper is published on Optica. Congrats! [7/16/2018] Bo Cao joined our lab as an intership undergraduate. Welcome! [7/11/2018] The Han lab awarded a grant from the NSF! [7/5/2018] Flat-field illumination paper is selected as one of the most downloaded articles in June from Optics Express. [7/2/2018] Our first News & Views out in Nature Photonics. 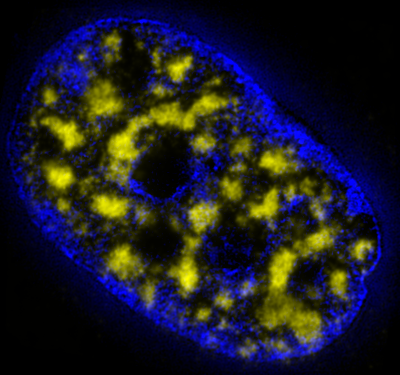 [6/15/2018] Live-cell imaging and STED microscopy reveal nuclear speckle dynamics. See our BioRxiv paper! [6/1/2018] Ian & Ben's work on the flat-field illumination is published in Optics Express! [5/25/2018] Ben has been selected as a recipient of UCF Multidisciplinary Doctoral Fellowship. Total award would be $120k. Congrats!! [5/1/2018] Jialei's HIST microscopy is posted on bioRxiv! 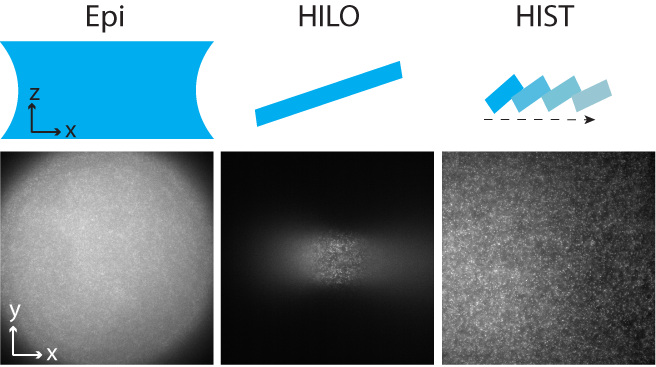 [4/7/2018] Our flat-field illumination imaging is posted on bioRxiv. Go flat! [03/2018] Chun Hung joined our lab. Wecome! [02/2018] Accurate single-molecule binding assay with centroid localization algorithm. [02/2018] Ben presented at a platform session in the BPS meeting. [12/2017] Jialei received the Doctoral Research Support Award ($3,000). Congrats! [11/2017] Our second paper! SiMPull on human brain tissues from Parkinson's disease. [11/2017] Thanksgiving group dinner at Gyu-Kaku, Orlando. Excellent Japanese BBQ. 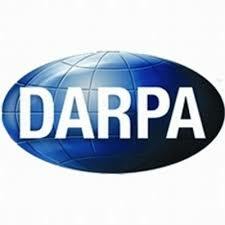 [10/2017] Attended DARPA kickoff meeting at DC. [09/2017] The first paper from our group.Congrats, Jialei! [06/2017] Jialei has passed PhD candidacy exam. Congrats! [06/2017] Ben has passed qualification exam. Well done! [06/2017] DARPA grant (RadioBio) will support Dogariu & Han for 4 years. Hooray! [04/2017] Kyu Young has been selected as Adviosry Panel in J.Phys.D: Applied Physics. [03/2017] Finally our lab is ready! [01/2017] Jialie presented his work at SPIE Photonic West. [12/2016] Spinach enables highlighting small RNAs in living cells. Published in NAR. [11/2016] Ian Khaw joined our lab. Wecome! [8/2016] Benjamin Croop joined our lab. Welcome aboard! [7/2016] Jialei attended CPLC summer school at University of Illinois. [6/2016] Jialei passed qualification exam. Congrats! [3/2016] A single-vesicle assay paper is published in JACS. [2/2016] Jialei joins the lab. Welcome, Jialei! [1/2016] Kyu Young started to work in CREOL. Copyright © Kyu Young Han. All rights reserved.